Bitter cold as Jags play in their third coldest game ever! 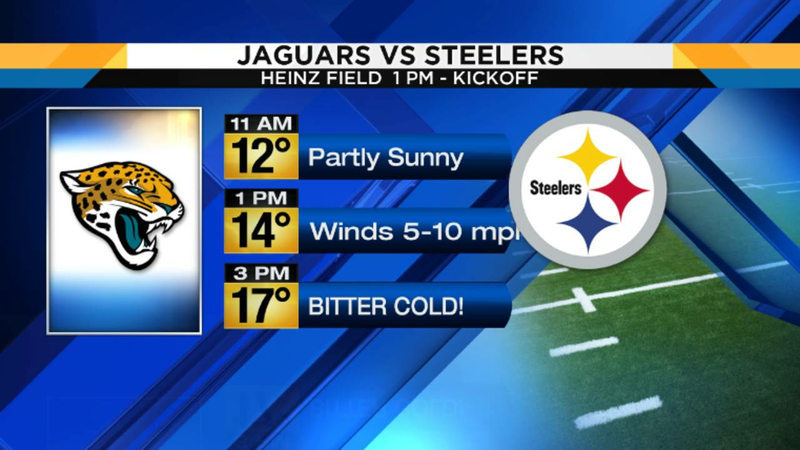 JACKSONVILLE, Fla. - About now, just about everyone has heard it will be cold in Pittsburgh on Sunday, the reality is it will be brutally cold, as game time temperatures will be only in the teens. Winds will be moderate around 10-15 mph, which will produce wind chill temperatures around 5-10 above zero. Jaguars head coach Doug Marrone has plenty of experience dealing with frigid temperatures. Before coming to Jacksonville he was the coach of the Buffalo Bills. Earlier this week Marrone shared a story on the coldest game he’s ever been a part of. If the forecast holds up, this will be the third coldest the Jags have played in their history. The coldest? Easily at Cincinnati on Dec. 17, 2010, when temperatures were around 12°F by the time the game ended, as winds were gusting up to 26 mph, producing wind chills from 5 below to around zero. The Jags lost 17-14. Next coldest? At Cleveland on Jan. 3, 2010, when the game time temperature was 16°F with winds 10-15 mph, producing wind chills just above zero. The Jags lost this one too, 23-17. Next coldest? At Chicago on Dec. 7, 2008, when game time temperature was 19°F and winds came off Lake Michigan into Soldier Field up to 20 mph, producing wind chills between 5-10°F above zero. Jags lost 20-6. So... This Sunday's game will be colder than the Chicago game, making it the third coldest game in the Jags young history. But wait! The Jags have been playing in the cold this season, easily the coldest stretch of road games the Jags have seen in their history. From Cleveland, where the Jags won when it was 34°F with snow showers; to Nashville, where the temperature was 26°F with wind chills around 15°F when the Jags lost an inconsequential game; to this weekend at Pittsburgh -- these three games will average temperature of 25°F and wind chills around 10-15°F. Green Bay didn't have three games that cold this year. But, will the Jags play well against Pittsburgh? It appears it comes down to points, more than weather, the Jags are (recently) 6-1 at Pittsburgh when they score 17 or more points and they are 5-0 if they score 18 or more points. A couple of those games played in Pittsburgh were with snow and cold or rain and cold. This means that it comes down to the offense, more than the defense (and weather) and the offense needs to score more than 18 points come this Sunday.